Do you store apples in your food storage? Real fresh apples? If not it is time to start! 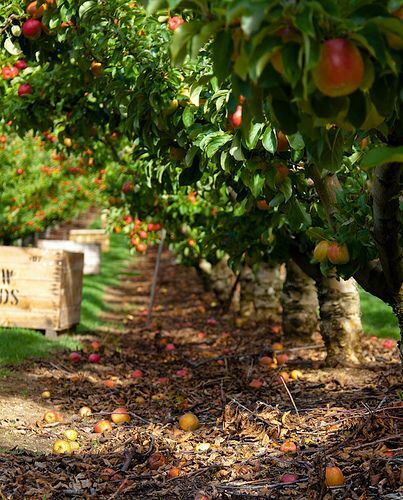 If you are new to root cellaring produce for the winter, than apples are great places to start. Everyone likes them and you can make delicious treats out of them. This fall I thought 3 boxes of apples was enough to last my family through the fall and early winter. We have already eaten through 1 ½ boxes and I haven’t even made any apple sauce. I guess I’ll need to find more apples to add to my food storage. I store my apples in my cold storage but they can also be successfully kept in a garage, root cellar, or any other cool area of your home. My sister spent time as a foreign exchange student in Germany. While she was there the Grandmother of the family made many traditional foods. 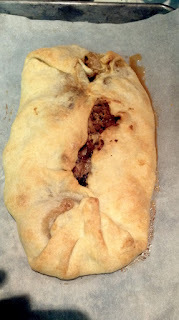 Apfel strudel was one of her favorites and she brought this home to share with our family. I call it by the German Apfel instead of the English Apple because this is NOT a frosting covered pastry you find at the doughnut counter. 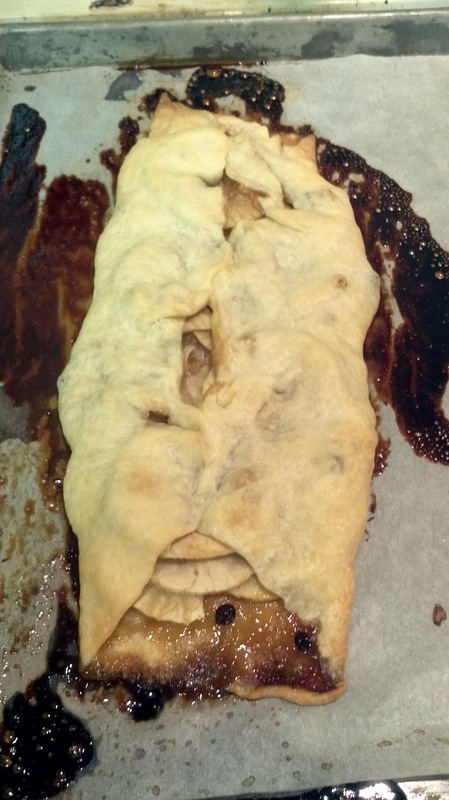 It is a slightly sweet apple filled pastry. It is served as a main dish along with a green salad and a vegetable it is dinner. Over the years one of the major problems we have had when making this has been that all the juices leek out and burn. So we tried it and it worked great! Isn't she cleaver? Preheat oven to the lowest temperature about 125 degrees, than turn oven off. Mix flour and salt, form into a well and add butter and milk. Mix well until combine. Knead the dough until elastic, and smooth. Form into a ball. 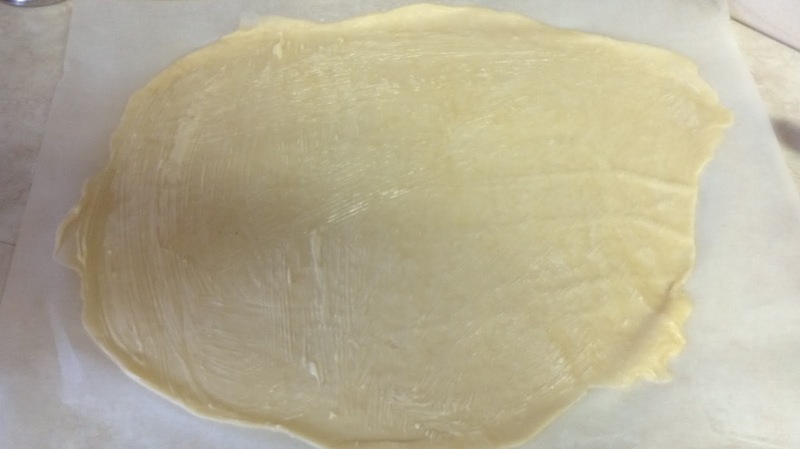 Place dough in a greased oven safe bowl. Allow to rest in the oven for 30 minutes. Remove from the oven. Divide the dough in half. Place half the dough on a piece of parchment and roll out. The dough should be soft and easy to work with. Roll it until it fills a cookie sheet size piece of parchment. Spread dough with melted butter. Place apples, currents, brown sugar and sour cream powder in a bowl. Toss to combine. Pile ½ the apple mixture down the center of the dough. Fold the edges (all 4 edges need to be folded up) of the dough up meeting in the middle. Brush the crust with melted butter. Repeat process with the second half of the dough. Bake 45 minutes in a 350 degree oven.